An imprinted decoration or mark on the outside cover of a book. 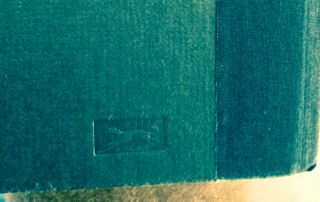 Publishers will press a design or mark into a book's cover for various reasons, such as the convention of the publisher Alfred A Knopf who presses their logo into the back board, near the hinge on their hardcover editions. Book club edition publishers would historically mark their editions by placing a small deboss in the back board. This would typically either be a small inked dot or square, or an uncolored deboss. An uncolored deboss is sometimes referred to as a blind stamp. A deboss is the opposite of emboss in which the docorative area is raised from the surrounding surface rather than being pressed into the surface.